As the name reveals, Shirazi Salad is originated from Shiraz, capital of Fars province, southwest Iran. It’s mainly considered a refreshing dish during hot summers of Iran although served with many Iranian foods all year round. It’s one of the most popular green salads among Iranians which is very easy and convenient to make. It has a lot of fans throughout the country. And here, I’m going to share the joy with you and explain how to make the savory Shirazi salad. It will be ready in a very short time. 1. Finely dice the cucumbers, tomatoes, and onion. Then blend them in a large bowl. Primary ingredients for this Iranian appetizer are what I mentioned here. But if you like, you can add some diced scallion and bell pepper. 2. Add some dried mint and parsley to your taste and mix. If the parsley leaves are fresh, you have to mince them, and if dried, crush them before adding. You can also use dried pennyroyal leaves instead of mint. 3. Add the unripe grape juice, salt, and pepper. Adjust the amounts to your taste. Although unripe grape juice is originally used for seasoning this Iranian appetizer, if it’s not available, you can substitute it with lemon or lime juice. 4. Add the olive oil and mix the ingredients well. Now you’re almost ready to serve. 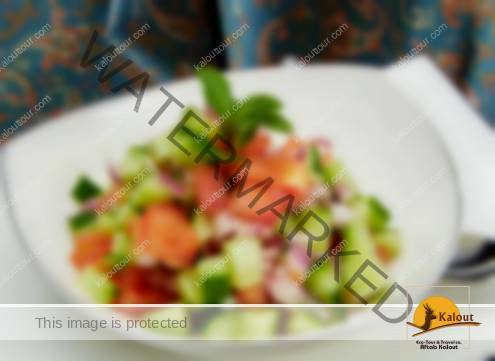 It would be better to refrigerate your Shirazi salad for about 1 hour before you serve it. In this way, the flavors mingle perfectly and the salad will taste more delicious. Transfer the salad into a big serving bowl or some small ones. You can cut designs into tomatoes, cucumbers, onions, or bell peppers, and use them for garnishing. Just make use of your creativity to do it. You can serve Shirazi Salad as an appetizer or a side dish with many of Iranian foods, especially those including rice. The pleasant sour and salty flavor alongside the crispy texture you feel in your mouth give you a great taste experience. You’ll be a fan of this popular, traditional salad like most Iranians.